lity will grow significantly in coming years in-mid of growing electricity demand. Moreover, growing demand for renewable sources of power generation has led to the various power projects across the globe, providing the boost to the shunt reactors market. Goldstein Research analyst forecast the Shunt Reactors Market to grow at a CAGR of 8.4% during the period 2016-2024. Further, the global shunt reactors market is predicted to reach USD 4.2 billion by the end of forecast period. 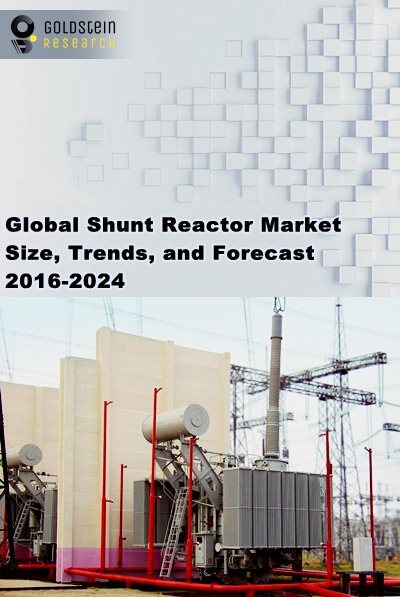 The report covers the present ground scenario and the future growth prospects of the global Shunt Reactors market for 2016-2024 along with the total sales of shunt reactor products in every region. We calculated the market size and revenue share on the basis of revenue generated from the sales of shunt reactors to various end user industries across the globe. On the basis of insulation type liquid type or oil immersed shunt reactors dominated the global shunt reactors market with more than 70% market share in 2016. The segment is projected to remain dominant over the forecast period, with CAGR of 8.0% over the forecast period. Global Shunt Reactors Market Outlook 2016-2024, has been prepared based on an in-depth market analysis from industry experts. The report covers the competitive landscape and current position of major players in the global Shunt Reactors market. The report also includes porter’s five force model, SWOT analysis, company profiling, business strategies of market players and their business models. Global Shunt Reactors market report also recognizes value chain analysis to understand the cost differentiation to provide competitive advantage to the existing and new entry players. Our global Shunt Reactors market report comprises of the following companies as the key players in the global Shunt Reactors market: ABB, Alstom, Siemens, General Electric (GE), Schneider Electric, ASEA Brown Boveri Group, Crompton Greaves Ltd., Hyundai Heavy Industries Co. Ltd., Mitsubishi Electric Corporation, Tebian Electric Apparatus, Bharat Heavy Electricals Limited, Toshiba Corporation and Motech Industries and Kollmorgen Corp. According to our global Shunt Reactors market study on the basis of extensive primary and secondary research, one of the major trend that driving the growth of shunt reactors market is large scale projects in developed regions for the modernization of outdated and inadequate power and supply network of electricity in developed regions. For instance, U.S is making significant investments for up gradation of its existing power generation and distribution infrastructure so that USD 80 billion could be saved which U.S. loses per year due to indirect cost of power failures. According to the report, major driver in global shunt reactor market is the rising CO2 emission across the globe owing to which new renewable power generating plants are setting up at large scale across the globe in order to achieve rising demand for electricity with lower CO2 emission. For instance, Europe could save some more than USD 46 billion in its drive to expand power generation from renewable resources by 2030. Further, the report states that one challenge in global shunt reactors market is presence of local players. Major players are providing highly efficient shunt reactors with longer life span which is likely to obstruct the demand for new shunt reactors as the demand for replacement products will decline over the forecast period. Geographically, Asia Pacific region dominated the global shunt reactor market, accounted for more than 28% revenue share in global market owing to huge government expenditure over energy sector and rapid urbanization. Asia Pacific region is anticipated to be the fastest growing shunt reactor market owing to huge investment towards the development and up gradation of power and transmission infrastructure in the region. The developing regions of Africa such as Nigeria provide immense potential for the growth of shunt reactors market as the region is witnessing significant growth in urbanization with augmented demand for electricity in urban as well as in rural areas. 8.2.8. Hyundai Heavy Industries Co. Ltd.